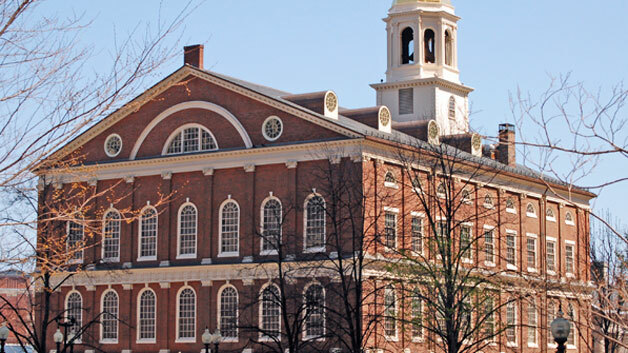 The Boston Festival of Bands is held every year in historic Faneuil Hall on the second Saturday in June. Each year we invite 6 other bands to perform alongside MetWinds in this full-day concert. This event is sponsored by MetWinds and is free an open to the public. It is truly an extraordinary opportunity to hear great ensembles perform in a historic setting. Information about this year's upcoming festival can be found on our events page. MetWinds is always eager to engage with groups who are potential new participants in this event! We have a long roster of ensembles that have performed with us throughout the last 30 years, and many of them regularly return because they enjoy it so much. We've had a wide variety of groups from small to large wind ensembles, and on occasion host some of the region's great brass bands. The festival runs from 11am-6pm, with a new group performing at the top of each hour. Each group performs 35-40 minutes of music, allowing for time for announcements and setup of the next group. MetWinds provides large percussion items that are available for use by the participating groups. Small items such as mallets, sticks, and certain specialty items need to be brought by your percussionists. Note that it can be difficult to get on the Faneuil Hall property so we recommend that you do not program music that requires extensive equipment outside of what is provided. The participation fee for the festival is currently $400. This helps to defray the extensive costs that MetWinds incurs bringing this event together. Contact us at festival@metwinds.org and we will add you to our list of interested bands. Each year in mid to late fall we reach out to our mailing list with a call for participation. That is your opportunity to let us know you are interested in the coming year's festival. If you are new to us, we will be interested to review some media (either online or on CD) that gives a sense of your group's performance level. While most groups are accepted as participants, we do try to maintain a level of consistency across our ensembles and we may defer emerging groups while they continue to mature. Click below to see a listing of groups that have previously performed at the festival.